Hi loves! 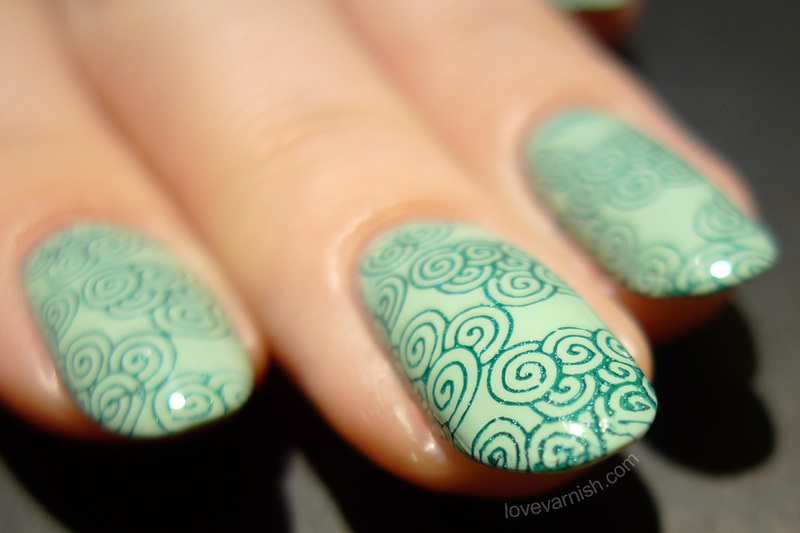 Another fun nail art look, featuring one of my favorite shades ever: a england St. George. It's just so versatile! As my base I used Sally Hansen Green Tea, which I scored a while back for the whopping price of € 0,99. Yeah, that's really really cheap :D! If you are curious to see the rest of the pictures, read on after the jump. Sally Hansen Green Tea is a lovely minty shade with a creme finish. It seems to pull more yellow on me when I compare it to other photo's, like this great look by The Nailasaurus. What I really like is the formula, as it is a creamy 2 coater without any effort. Now I have some trouble leaving blank canvases exactly that, so I grabbed my MoYou London Suki 08 plate and together with a england St. George I created this lovely tone on tone look. It seems I shouldn't wait too long with getting a back up of that shade, otherwise I'll run out of it! What do you think of this combination? 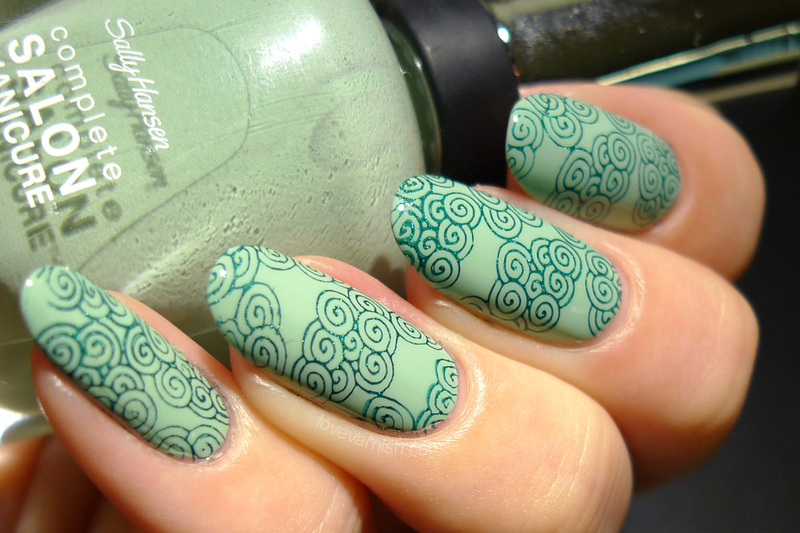 And do you own Sally Hansen Green Tea? This combination is stunning. Green Tea is a great shade of green as well! This many makes your nailbeds look EXTRA long. I'm in love. Plus the mani itself is amazing! 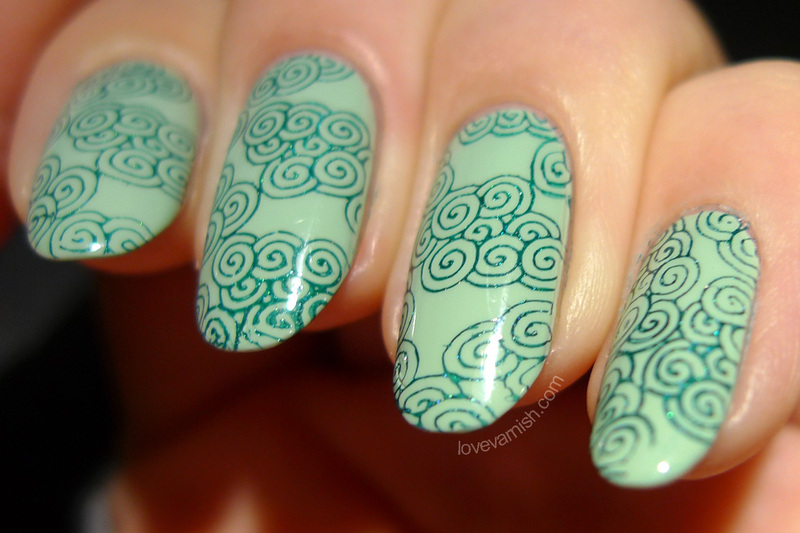 ooooooh this stamping is so pretty! I looooove the color combo as well as that MoYou plate! It's a really versatile plate :).